Although fire-raisers have been busy in Naples, clearing out the Roma shantytowns, these have not been their only targets. According to Deutsche Welle, desperate residents have also taken to firing the growing mountains of rubbish which, despite the implementation of emergency measures and the intervention of the EU, are still plaguing the city. Over the weekend, more than 100 fires had been set to the mountains of rubbish, severely taxing overburdened fire-fighters, who were already heavily engaged in dealing with the Roma fires. Nor has the intervention of fire crews been welcome. A television team recorded stones being thrown at one fire crew as it attempted to put out a fire in the suburb of Barra. DW cites a fireman saying that: "They are also attacking us because of the mountains of rubbish in the streets … It's not the first time they have tried to attack us, and I fear that it will also not be the last." 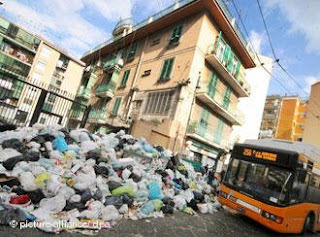 At the height of the crisis in January, there were 7,000 tons of rubbish on the streets of the city of one million and the surrounding Campania region but, although this has been reduced to an estimated 5,000 tons, rising temperatures have exacerbated the problem, as the stink is more apparent. On top of dealing with the immigrants, therefore, Berlusconi is now faced with another of Prod's legacies, and has said he will treat this rubbish crisis as a priority. Meanwhile, the EU commission is pursuing legal action and is complaining that the government's measures have been insufficient completely to resolve the crisis. It is little comfort that Prodi also left behind him a pile of rubbish in Brussels, created during his tenure as commission president. Aren't we glad to be funding NGOs? Politics is dead … long live politics! The silence of the "colleagues"
Global warming – Swedish style! Where is that international community? Why are we unable to act?